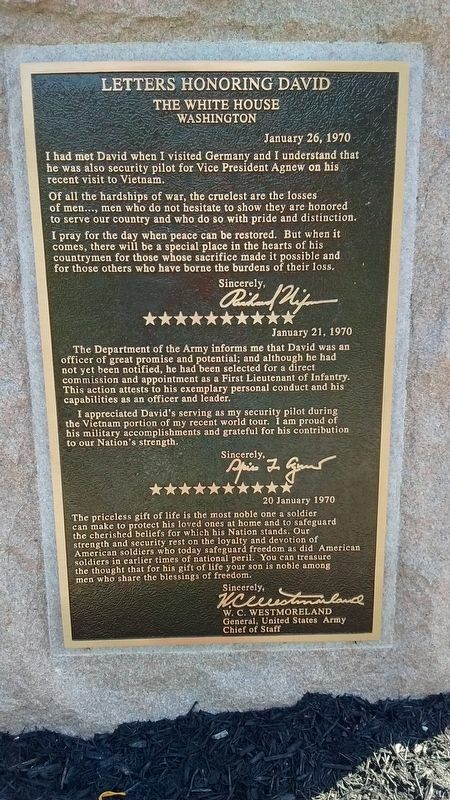 Graduate of Archbold High School in May of 1967 and entered military service in June of 1967. Entered Vietnam in August of 1969 with the 17th Air Cavalry Troop B, 3rd Armored Squadron. Shot down Jan. 12, 1970 and passed away four days later. I had met David when I visited Germany and I understand that he was also security pilot for Vice President Agnew on his recent visit to Vietnam. Of all the hardships of war, the cruelest are the losses of men..., men who do not hesitate to show they are honored to serve our country and who do so with pride and distinction. I pray for the day when peace can be restored. But when it comes, there will be a special place in the hearts of his countrymen for those whose sacrifice made it possible and for those others who have borne the burdens of their loss. promise and potential; and although he had not yet been notified, he had been selected for a direct commission and appointment as a First Lieutenant of infantry. This action attests to his exemplary personal conduct and his capabilities as an officer and leader. I appreciate David's serving as my security pilot during the Vietnam portion of my recent world tour. I am proud of his military accomplishments and grateful for his contribution to our Nation's strength. The priceless gift of life is the most noble one a soldier can make to protect his loved ones at home and to safeguard the cherished beliefs for which his Nation stands. Our strength and security rest of the loyalty and devotion of American soldiers who today safeguard freedom as did American soldiers in earlier times of national peril. You can treasure the thought that for his gift of life your son is noble among men who share the blessings of freedom. 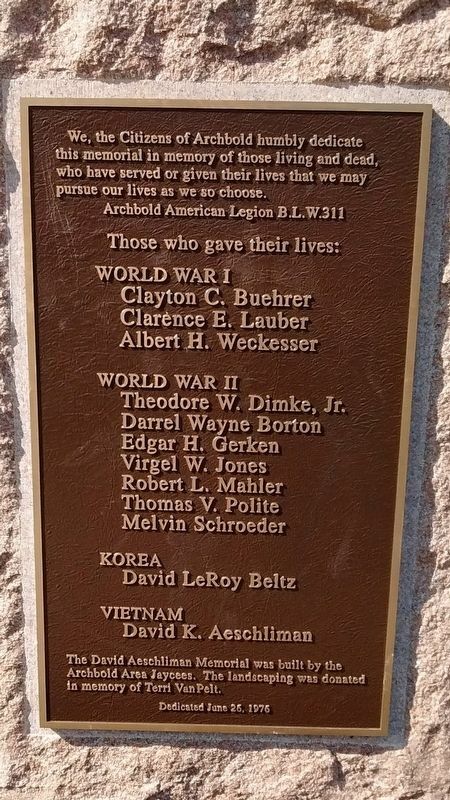 We, the Citizens of Archbold humbly dedicate this memorial in memory of those living and dead, who have served or given their lives that we may pursue our lives as we so choose. The David Aeschliman Memorial was built by the Archbold Area Jaycees. 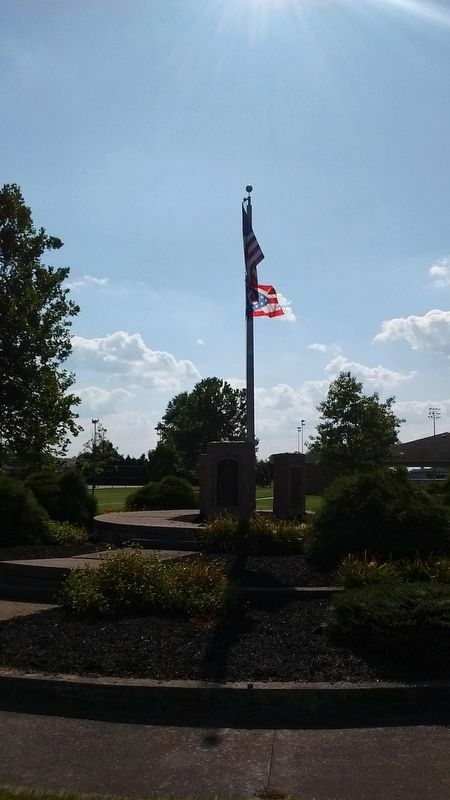 The landscaping was donated in memory of Terri VanPelt. Erected 1976 by Archbold Area Jaycees. Location. 41° 30.79′ N, 84° 18.498′ W. Marker is in Archbold, Ohio, in Fulton County. Marker is on South Pleasant Street, on the left when traveling north. Touch for map. 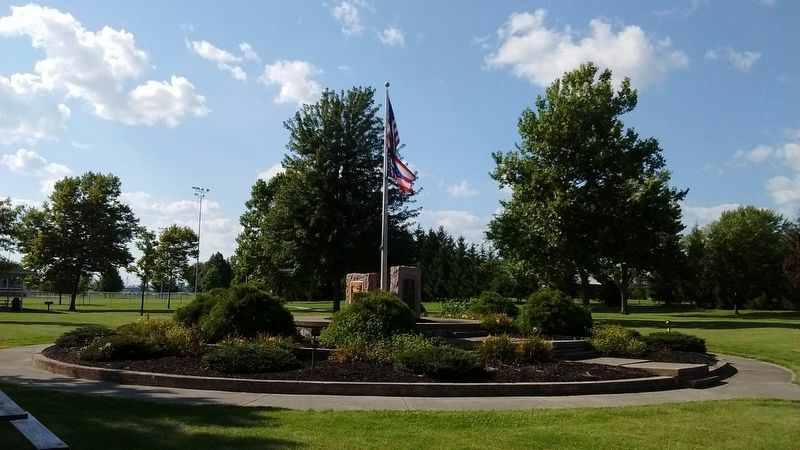 Memorial is located in Archbold Memorial Park. Marker is in this post office area: Archbold OH 43502, United States of America. Touch for directions. Other nearby markers. At least 8 other markers are within 11 miles of this marker, measured as the crow flies. The Ohio Art Company (approx. 0.6 miles away); Erie J. Sauder (approx. 2.1 miles away); Draining the Great Black Swamp (approx. 4.3 miles away); Stryker Depot (approx. 5.7 miles away); Stryker's Railroad Heritage (approx. 5.7 miles away); Stryker (approx. 6.1 miles away); Evansport (approx. 7.7 miles away); Casimir Pulaski (approx. 10.3 miles away). Touch for a list and map of all markers in Archbold. More. 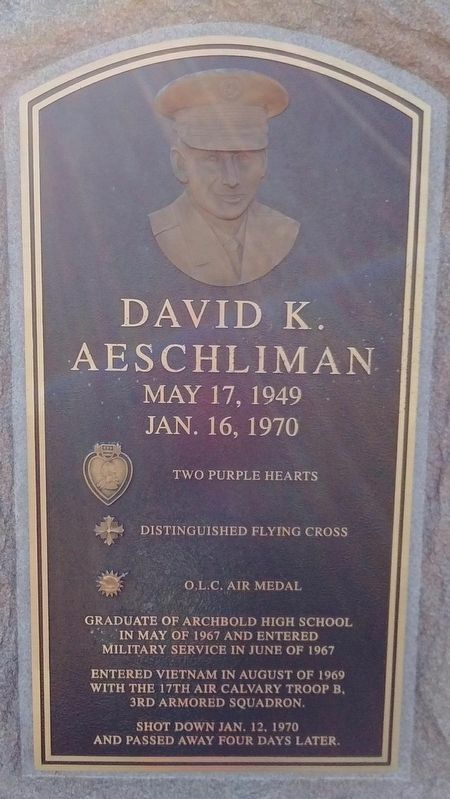 Search the internet for David K. Aeschliman Memorial. Credits. This page was last revised on March 13, 2019. This page originally submitted on March 10, 2019, by Tom Bosse of Jefferson City, Tennessee. This page has been viewed 53 times since then. Photos: 1, 2, 3, 4, 5. submitted on March 10, 2019, by Tom Bosse of Jefferson City, Tennessee. • Bill Pfingsten was the editor who published this page.